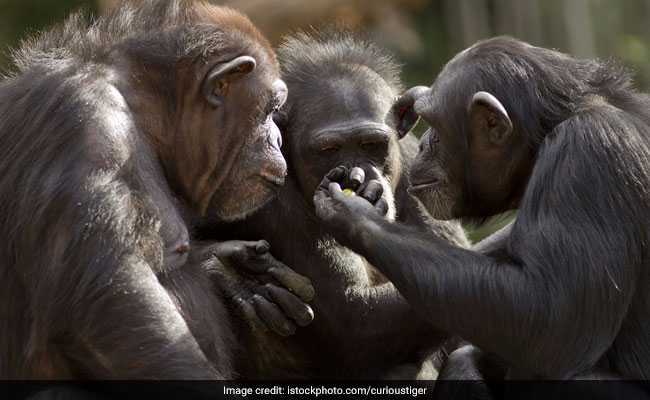 Tokyo: Chimpanzees can play the popular rock-paper-scissors game as well as four-year-old children, a study has found. Chimpanzees of all ages and all sexes can learn the simple circular relationship between the three different hand signals used in the game, researchers said. Even though it might take them longer, they are able to learn the game as well as a young child, they said. The study by Jie Gao of Kyoto University in Japan and Peking University in China compared the ability of chimpanzees and children to learn the rock-paper-scissors game. The study "suggests that children acquire the ability to learn a circular relationship and to solve a transverse patterning problem around the age of four years," said Gao, lead author of the study published in the journal Primates. "The chimpanzees' performance during the mixed-pair sessions was similar to that of four-year-old children," said Gao. The researchers wanted to find out whether chimpanzees (Pan troglodytes) can grasp extended patterns. They used the rock-paper-scissors game, a popular children's game in which the hand signal for "paper" always beats "rock," while "rock" trumps "scissors," and "scissors" defeats "paper." The relationship between the signals are non-linear and must be understood within the context of how the pairs are grouped. Learning such transverse patterns requires enhanced mental capacity and it is useful when forming complex relationship networks, solving problems, or updating what you already know about a subject. Seven chimpanzees of different ages and sexes living in the Primate Research Institute at Kyoto University were part of the experiment. They sat in a booth housing a computer-based touchscreen and were trained to choose the stronger of two options (based on the rules of the game) they saw on screen. They first learnt the paper-rock sequence, then the rock-scissors one and finally the scissors-paper combination. Once they knew how the pairs fitted together, all the different pairs were randomly presented to them on screen. Five of the seven chimpanzees completed the training after an average of 307 sessions. The findings show that chimpanzees can learn the circular pattern at the heart of the game. However, it took them significantly longer to learn the third scissors-paper pair than it did to grasp the others, which indicates that they had difficulty finalising the circular nature of the pattern. The research team then also taught the game to 38 pre-school children to compare the learning process of chimpanzees with that of humans aged three to six. The children had little difficulty grasping the game, and on average did so within five sessions. Their performance was, however, subject to age. The older the children were, the more accurate they became when all three pairs were randomly presented to them. Participants older than 50 months (about four years) played the game with more skill rather than luck.